Air Gap station installed on the Ben Franklin Bridge in Camden, NJ. The Delaware office is a NOAA centric office focused on Operation, Maintenance, Repair, and Management contracts for the NOAA CO-OPS PORTS networks. Presently the office has five staff members based in Dover, DE and one technician in Gloucester, VA.
Woods Hole Group personnel perform operations and maintenance activities for NOAA PORTS systems in the Northeast and Mid-Atlantic Regions under the “Operation, Maintenance, Repair & Management of the East Coast Observing Systems” contract from NOAA. This covers the Narragansett Bay, New London, New Haven, New York-New Jersey Harbor, Delaware River and Bay, Upper Chesapeake Bay, Lower Chesapeake Bay, and Charleston PORTS networks. Woods Hole Group staff provides NOAA with unparalleled service providing routine and annual maintenance, along with station upgrades, station installations, and emergency repairs for NOAA PORTS. Meteorological station installed at the US Navy Craney Island Fuel Depot in Portsmouth, VA. The Delaware office also partners with Texas A&M University-Corpus Christi, Conrad Blucher Institute (CBI) servicing PORTS and NLWON stations for NOAA, Lake Charles PORTS, Houston-Galveston PORTS, and the Texas NWLON network. These stations are managed by Woods Hole Group, and day to day operations are performed by CBI. In March of 2016, Woods Hole Group was awarded the contract to perform the operation and maintenance of the TCOON network in Texas. This includes annual maintenance and emergency repairs for 26 stations along the Texas coast. The first year of annual inspections were completed for this network in September 2016. The contract also includes completion and service for two offshore single pile water level stations. All equipment has been installed at the stations. Next steps include installation of benchmark networks and the leveling surveys.During July and August, Woods Hole Group and CBI performed four of the annual inspections. CBI has been the primary contractor for the State of Texas for these stations since they were funded and installed. During the past six-months, Woods Hole Group is in the process of installing multiple new water level, air gap, and visibility stations. 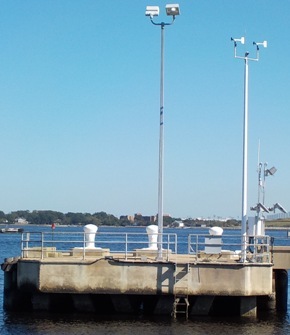 A visibility station in Providence, RI at the Save the Bay facility within the Narragansett Bay PORTS system has been completed and is pending final inspection by NOAA. Within Delaware Bay PORTS, Woods Hole Group completed the installation of an Air Gap station on the Ben Franklin Bridge in Camden, NJ. 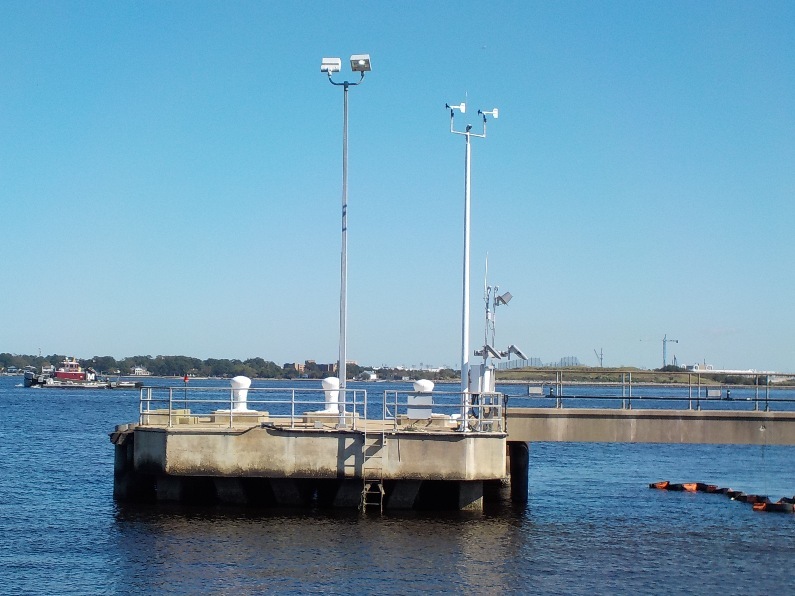 We are presently working on the installation of a new water level station in Marcus Hook, PA, along with conductivity sensors being added at the Lewes, DE and Cape May, NJ water level stations. Southbank Riverwalk water level station in downtown Jacksonville, FL. In the Chesapeake Bay PORTS network, Woods Hole Group personnel installed a meteorological station at the Craney Island Fuel Depot in Portsmouth, VA in early October 2016. Data from this station is being disseminated now, providing valuable wind data in the Elizabeth River for the surrounding port facilities. The installation of a visibility station near the Francis Scott Key Bridge in the Chesapeake Bay is expected to be completed by spring 2017, pending final approval. An installation of a conductivity sensor at the Chesapeake City water level station is also pending. The operation and maintenance phase of Jacksonville PORTS network that Woods Hole Group installed for the Jacksonville Marine Transportation Exchange (JMTX), in partnership with NOAA, has been ongoing since April 2014 when the JXPORTS was declared operational and public dissemination of the data started. The Jacksonville PORTS network is the second largest behind the Chesapeake Bay PORTS network, consisting of eighteen stations along the St. Johns River. It includes six water level stations with associated sensors, three visibility stations, seven current meter systems, one conductivity-only station, and one air gap station. The data is available on the NOAA PORTS webpage. Woods Hole Group continues with the third year of Operations and Maintenance of this PORTS network. We are presently working with JMTX to secure additional funding to extend the operations and maintenance. At this time all stations are fully operational and producing high quality data for the St. Johns River maritime community and future port stakeholders in Jacksonville. Hurricane Matthew recently impacted the Jacksonville, FL area in early October 2016. The network performed as expected prior, during, and after the hurricane, providing valuable oceanographic data to the maritime community and emergency management agencies in and around Jacksonville. A post-hurricane inspection of all stations found all but one station, sustained no damage due to the effects of the hurricane and its high winds and storm surge. The only station damaged during the hurricane was due to a failure with the pier structure on which it was installed. A second wind monitoring station with visual and audial alarms at the Kinder Morgan Elizabeth River Terminals in Virginia was installed in July 2016. The new station provides Kinder Morgan personnel with the required wind data at the facility to meet requirements for off-loading permits. The Delaware office continues to provide support for the ongoing Philadelphia Water Department project, providing field support for the long-term current monitoring stations and short-term current meter deployments. The Woods Hole Group Delaware office will continue to work closely with the Falmouth, MA and Houston, TX offices supporting the NOAA PORTS contracts and additional projects throughout the remainder of the year.